Materials: Polished stainless steel. Chromed iron chain. Aluminium canopy, 4 Bakelite sockets. Electricity: 4 x E14 bulbs, 4 x 40 watt maximum, 110/220 volt. Any type of light bulb can be used, preferably a small round one. For this setup silver cupped light bulbs were used. Manufacturer: To be appraised. An Italian company. Stainless steel or inox is an alloy of iron and chrome. 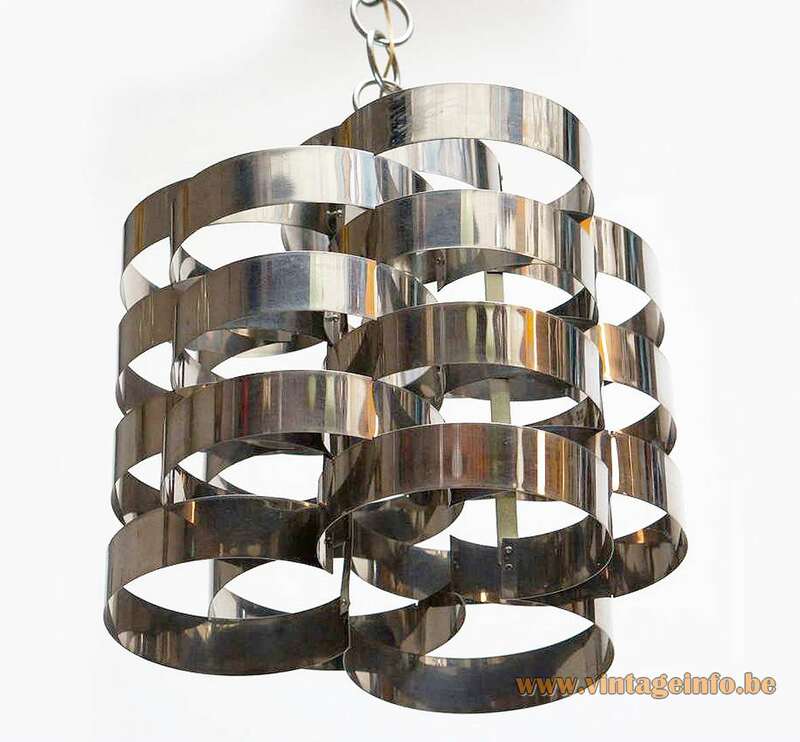 A stainless steel table lamp in all probability made by the same producer is an Italian lamp. It is on display here on Vintageinfo. Often described as a lamp made by Reggiani. 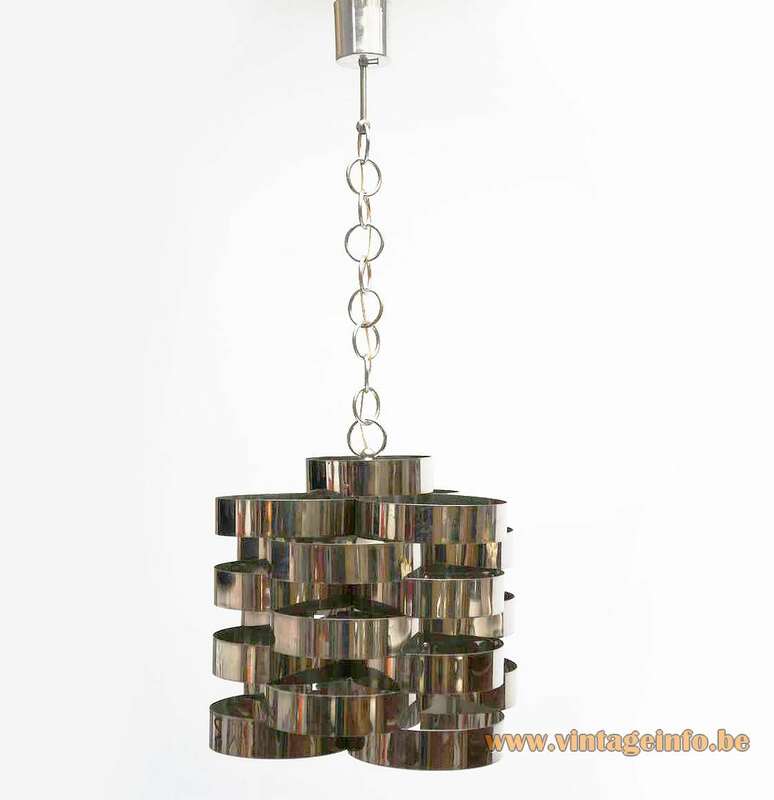 Reggiani made many lamps in polished stainless steel. Often described as a lamp made by French artist Max Sauze. Max Sauze produced/produces similar lamps, but all made in aluminium. A few times described as a lamp designed and made by François Monnet for Uginox. Uginox is the company of Editions Monnet F. & B., in the 1970s it became Kappa. Designers that worked for Uginox/Kappa were, among others Joelle Ferlande, Maria Pergay, Patrice Maffei and François Monnet. 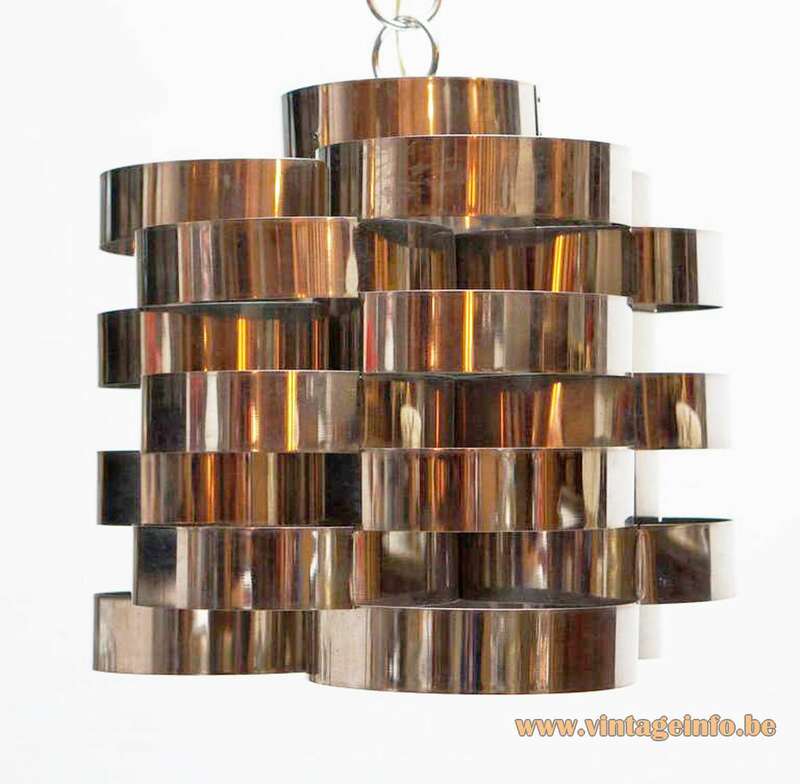 Uginox is famous for their stainless steel furniture and lighting. Inox is stainless steel. 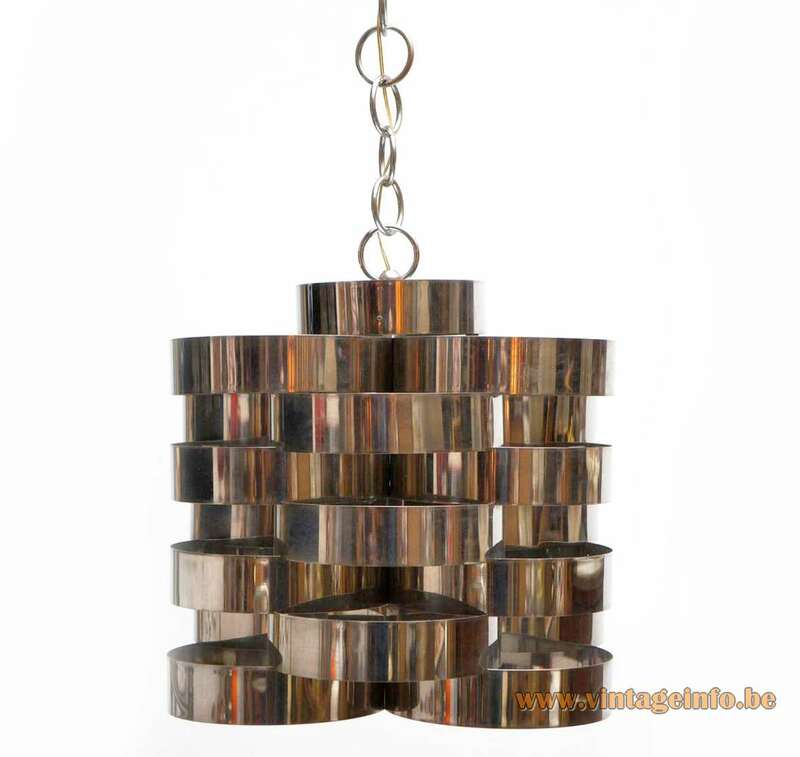 Maison Charles produced and produces several lamps in stainless steel. One fine example with some similarities is the Ruban table lamp, designed by Jacques Charles. 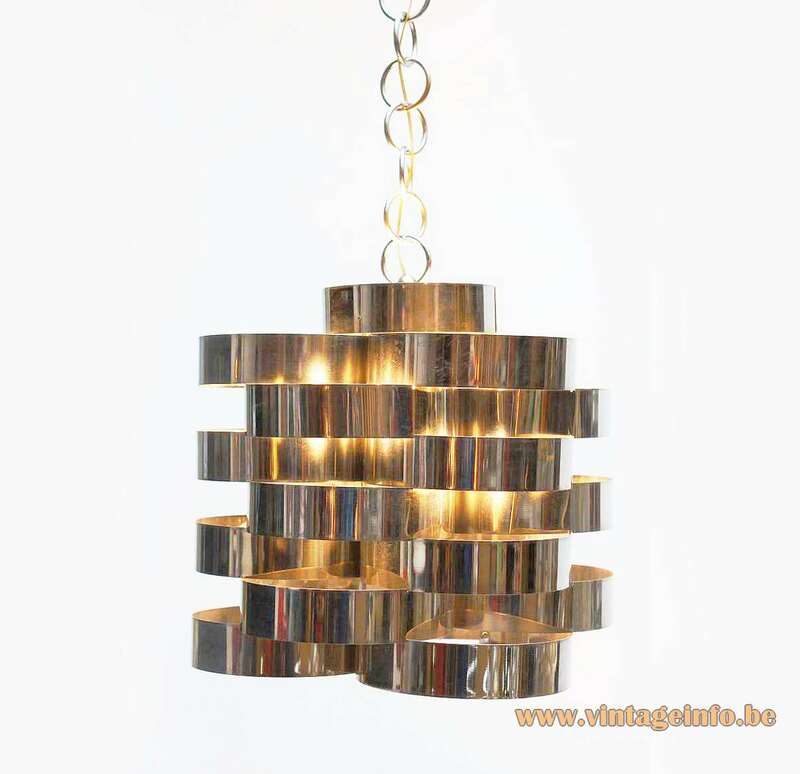 Stainless steel lamps in this style were among others designed and made by Robert Sonneman and Curtis Jere (USA), Louis Durot (France), Henri Mathieu(France), Gallery Oxar (France), Michel Boyer (France), Jacques Quinet(France), Françoise Sée (France), Reggiani (Italy). Lumenform (Italy), Gaetano Missaglia (Italy). Edera Radici designed for Sagim (Italy), Polam (Poland).Stilnovo (Italy) produced the Spinnaker lamp designed by Corsini and Wiskemann in 1968. The Curtis Jerré “Cloud” chandelier has many similarities with this one. Sciolari also produced many lamps with chrome and stainless steel, but mostly in combination with other metals such as brass. It was one of the trademarks of Gaetano Sciolari. 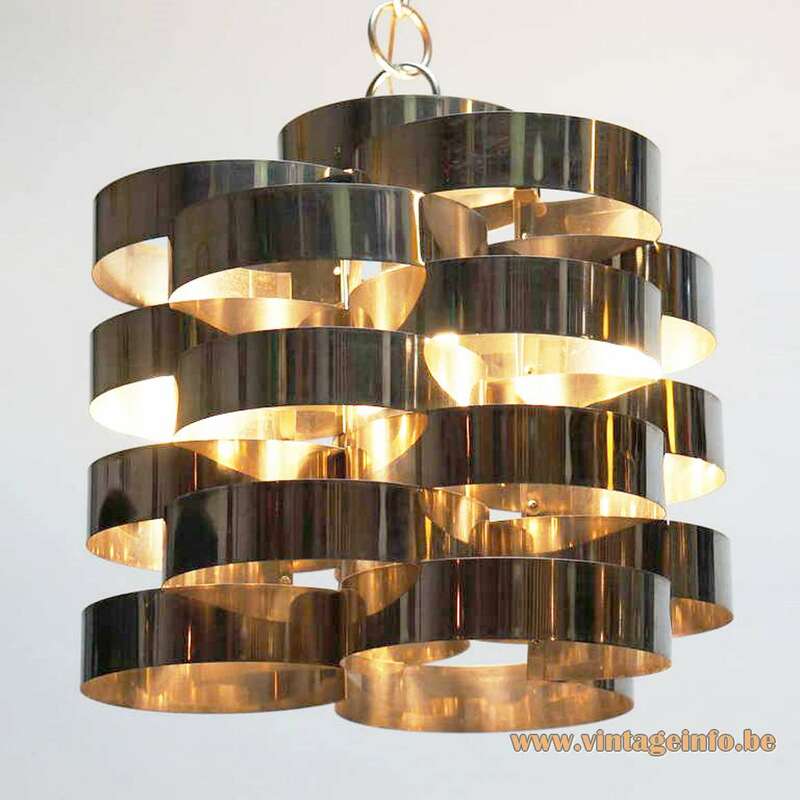 Copper and brass lamps in the style of this chandelier were produced by Coronel from Denmark.